1:58 filled at 1288 for a nice +9. Thank you for coming. See you next week. Take a course or two. 1:24 during congestions like this, one can often use a Face of God pattern to find when they might end. get another boost about the second trade time, suggesting a carry through, so I'm content to wait. like if I'm writing a program. But in trading, the only control I have are my entries and exits. SHE controls the pacing. by the Moon conjoining S&P natal Chiron. Who would think a 220 KM rock was so powerful? But there is evidence that it is surrounded by a million mile diameter pulsating energy field. 11:00 may stall here for a while. I've locked a small gain early in an up fractal, so I'll just try to hold. 10:14 yesterday's outcry highs were at 1283, a prime number. Should be resistance today. 10:00 notice the nice round bottom on the 110 EXMA. This is what I mean by "curl". 9:42 the MTRainbow chart shows a weak but not collapsing market. Lokks like a "hold it up" day. 1/14/2011 10:49:34 AM MT TG****:: Al, don't want to be a pain but there is just a rainbow chart with your black swan diagonal lines. The other charts have white boxes with red X's in them. 1/14/2011 9:37:58 AM MT TG****:: Al, there isn't a FOP in the Chaos chat room. 1/14/2011 8:34:57 AM MT RAH:: Good to have you back in the Clinic today Al! 1/14/2011 7:50:51 AM MT Al****:: GM all-good luck today. All is on track with my back. Thanks for the concerns. 1/14/2011 7:48:49 AM MT MJ:: Welcome backwb Dr. Larson. Hope all is well. 1/14/2011 7:42:03 AM MT EOE:: welcome back AL. 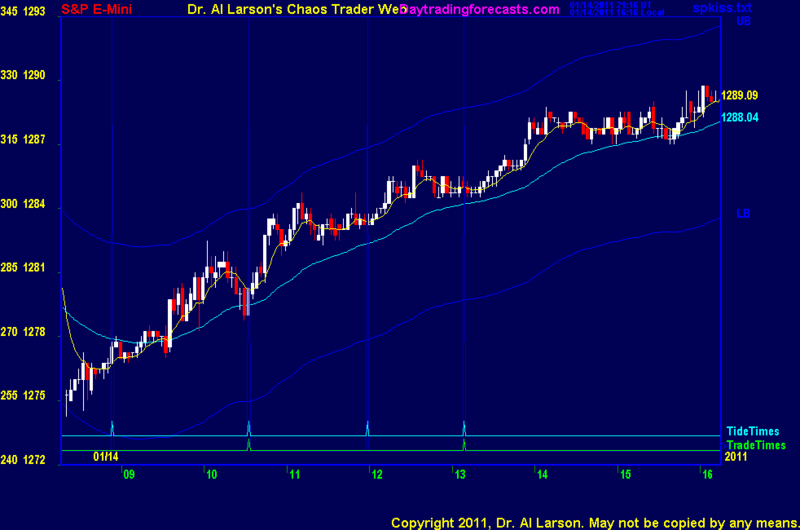 1/14/2011 7:32:59 AM MT RAH:: Not actively trading yet, my change in charting/broker etc still in flux. I'm doing small Spread Betting on using broker charts outside of Ninja. I'm really annoyed to be limited like this just when I'm getting used to FoP! 1/14/2011 7:31:00 AM MT RAH:: Hey all, another balmy day in the UK - 10.4C apparently - thats 50.7F. Total cloud cover from my window, so 100% normal then! LOL No Clinic from Al today? Thats a shame! I'm sure you'll be bouncing around soon Al! 1/14/2011 7:28:39 AM MT EOE:: GM everyone. a balmy 19F here this morning. Good luck.